Those who know me know that there is one and only vendor from whom I will buy coffee beans. That vendor is George Howell (http://terroircoffee.com/). There are few vintners who choose grapes with as much care as George chooses beans for his coffees. I just had to see his roasting plant! About a year ago, my wife and I were picking apples in a town not far from Acton. I just couldn't be so close to the company without visiting. We stopped there, I walked in, and there I was at a reception desk, with a few small cubicles in the background. It looked more like a mom-and-pop insurance company than an internationally respected coffee company. Though I could see the door that led to the spacious roasting area, I quickly surmised that the facility was not like Ben & Jerry's. You can't just walk in and get a tour of the place. I left disheartened. A year passed. One day, I was excited to see the Internet announcement that George Howell was having an open house, limited to 50 attendees. I couldn't get on the phone fast enough to make my reservation! Yesterday was the long-awaited open house. Family constraints prevented me from attending the whole thing. The portion that I attended, however, was mesmerizing. George knows coffee beans the way Verdi knew notes. He has knowledge, passion, and that particular calmness found only in someone who knows his or her field better than anyone else. All of George's coffees are single-origin coffees – meaning that when you buy a bag of his coffee, all the beans in that bag are from one location. But that is only the beginning. The rigorous, multi-step selection process by which individual beans are accepted or rejected is sans pareil in the world. But George does not rest on that laurel. After all, when coffee is transported from a cool mountaintop to a 100-degree port to a 55-degree hull of a ship, the flavor will be comprised before the beans even reach our shore – unless, of course, you have George Howell's associates packaging those beans and monitoring their freshness at every juncture. There's no other way to say it: George Howell makes the best coffee in the world. After the open house I met George, shook his hand, and felt like I had just met Mickey Mantle. Today I had coffee on my mind. I went to make an espresso and suddenly realized: I was out of regular beans! Where could I get some in a hurry? 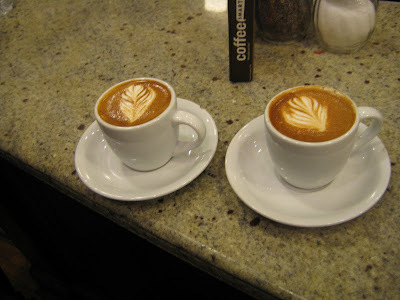 I remembered that in nearby Newtonville, there was a cafe that George recently purchased, called Taste Coffee House (http://www.tastecoffeehouse.com/). I called them up. A girl answered. I asked her which dark roasts they had in stock. "One minute, George is right here." Pause. Then at the other end I hear, "This is George Howell." My speech went from allegretto to vivacissimo. Within five minutes Jeanette, the baby, and I were in the car headed to Newtonville. And there was The Man, sitting at the counter, drinking an espresso macchiato. I said to the girl, "I'll have what he's having." I greeted George, and we chatted about ... well, coffee. I spoke with disdain about a certain large competitor that, George informs me, is opening one new store a day in China. Growth at the expense of quality. Or as George unforgettably put it: "If you cover the whole world, you're flat as a pancake." I'm a musician, and to me, music is the most important thing in the world. But maybe it isn't the most important thing. Maybe it's not important at all. And maybe coffee's not important. 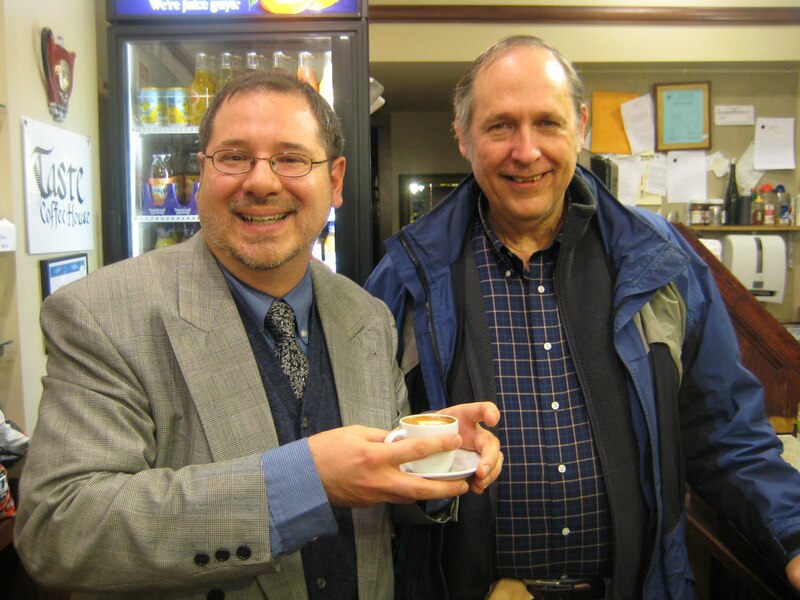 But when you're in the presence of George Howell, there is not a fiber inside you that does not feel that coffee is the most important thing in the world. He doesn't try to sell it. He is it.